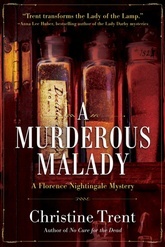 Cholera has broken out in London in the summer of 1854, but Florence Nightingale has bigger problems when people begin dying of a far more intentional cause—murder. It begins with an attack on the carriage of Florence’s friend, Elizabeth Herbert, wife to Secretary at War Sidney Herbert. Elizbeth survives, but her coachman does not. Within hours, Sidney’s valet stumbles into the hospital, mutters a few cryptic words about the attack, and promptly dies from cholera. Frantic that an assassin is stalking his wife, Sidney enlists Florence’s help, who accepts but has little to go on save for the valet’s last words and a curious set of dice in his jacket pocket. Soon, the suspects are piling up faster than cholera victims.